We don't mean to brag, but our staff in the best in the business! Their job is to ensure you and your kids have the best experience possible while staying safe during your visit! Our friendly, trained staff is excited to help you from the moment you arrive in the parking lot, until the guest of honor makes a wish and blows out the candles! They make sure your experience is top notch and stress free. Most importantly, we ensure you and your guests get the royal treatment! We offer exciting add-ons to make your party unique and extremely fun for the kids! 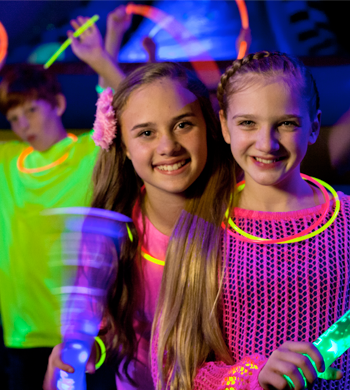 With our GLOW Party experience, we turn down the lights and turn up the fun! Pump Up your party with special FX lighting for an amazing birthday party that will leave a lasting impression with all of your guests. Each child gets a glow bracelet and the birthday child gets a glow necklace. Our Bubble Bash is fun for all ages. We turn on our bubbles machine for the last 10 minutes in our first arena to fill the area with tons of bubbles. Ready. Aim. Tag! 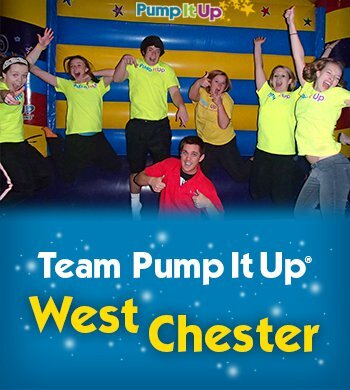 Kids will have a blast playing Laser Blast in one of our inflatable filled arenas of your choice. 20 Laser Blasters are provided with an attached sensor that goes around the upper arm. 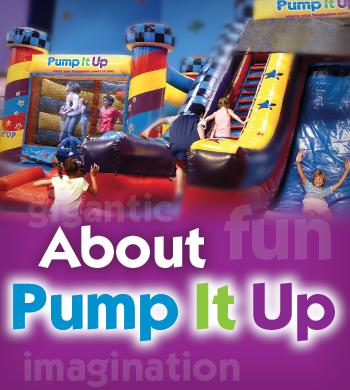 Fun for kids and adults! Our experience was outstanding. Staff was excellent and friendly. My daugthers had a blast. They made it special for them. Great experience and we would definitely recommend. Staff pleasant and friendly, professional. Great time for the kids. Clean. The staff was fun with the kids (ie. asked our son how he wanted all the kids to walk back to the inflatables after viewing the video, they all hopped on one leg! fun idea for kindergardners!!). The team that was in the play area with us were excellent. Extremely friendly and outgoing. It makes it more enjoyable for everyone when the staff seem to really enjoy their job. I was truly impressed with the organization and execution of the party. It was such a relief to simply enjoy my son on his birthday. I can't think of another time I got to have so much fun WITH my son. Usually I get to watch him have fun with other kids but I loved that I was able to be a part of the experience. The staff was extremely courteous and nice. Smiles on everyone's faces and everyone was willing to help with anything. 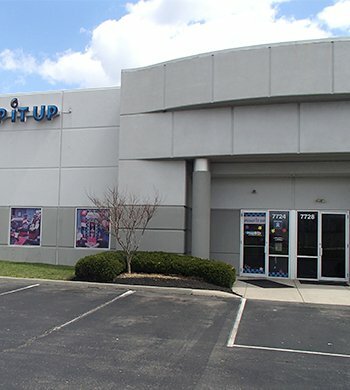 We are located in West Chester, on Service Center Drive off Cox Rd. Between the Tylersville and Liberty Way exits. Right between Four Corners church and the Cincinnati Enquirer.